Review of Harpoon Summer Beer. | Beer Apprentice - Craft Beer News, Reviews, Interviews and Info. Review of Harpoon Summer Beer. Let’s try another Summer refresher for today’s craft beer review, what do ya say? How about a Harpoon Summer Beer from the Harpoon Brewery (harpoonbrewery.com) located in Boston, Massachusetts. Let’s see what the commercial description has to say about this brew. Harpoon Summer Beer is a Kolsch style ale. Originating in the Rhineland city of Cologne (Koln), Kolsch ales have the characteristics that many people associate with lager beers. Kolsch is brewed with an ale yeast, but like other northern German light ales, it is straw gold in color and light bodied. The flavor is mild. The hopping levels provide a crisp, dry finish that make this beer particularly refreshing. 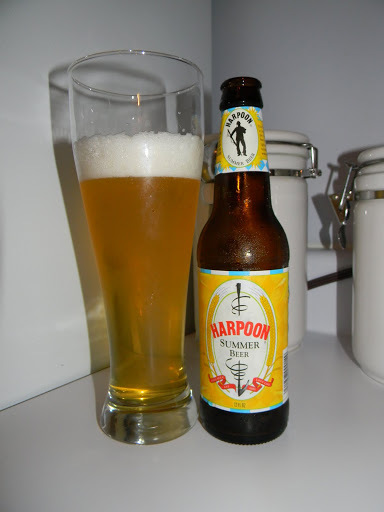 The appearance on the Harpoon Summer Beer was a clear, golden/straw yellow color with a bright white, soapy, fluffy head. It had very nice size, however the retention time was limited and the lacing was only average in my opinion. I did find a few bubbles rising to the top to create a nice aesthetic appeal. In the nose, I picked up on some mild lemon citrus hints, fresh green apples and a grainy/biscuity malt. The background presented a light flowery hop profile. After it warmed a bit, the sweetness from the citrus began to die down and the maltiness started to stand out a touch more. The overall fragrances were balanced pretty well, however I thought them to be a little complacent. The taste revealed a nice, light lemon grass flavor with a small hop bite and bitterness. A minute amount of sourness was noticed and I did find that it lingered into the aftertaste a touch longer than I tend to like. Some faint crackers and wafers added a little “smoothness” to the taste. Also, I started to notice the most minuscule spice of pepper or coriander right at the very end. Like the aroma, the flavor seemed to be a tad tranquil. The mouthfeel was medium to thin, mostly dry, smooth, crisp and thirst quenching. Like the description says, it is VERY refreshing. What flavor was left on the palate dissipated rather quickly after the drink went down the throat however. No doubt about it, this would be a great Summer beer. The only thing is…. I’ve had better. Kolsch’s are not my first choice when it comes to style. I like them, but I have to be in the mood for them. A hot, humid day may put me in the mood pretty quick though!!! This particular beer didn’t quite have the “kick” or “oomph” that I was looking for. Don’t get me wrong, I can definitely drink it and the drinkibility rating would be pretty high, but for me, it was just “ok.” Everything seemed to be balanced well, although just subdued and meek. Thanks for reading everyone. I hope you guys are enjoying the reviews.